BROOKSIDE – Two people were arrested by Washington County Sheriff deputies in Brookside Sunday afternoon on counts of burglary and drug possession. 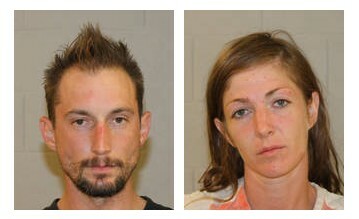 Washington County Sheriff Deputy Nate Abbott said Anthony Angelo Pierucci, 35, and Kelli Bo Slade, 32, both of St. George, were arrested for allegedly burglarizing a home on Cottonwood Drive in Brookside. Brookside is an unincorporated community in Washington County located along state Route 18 between Veyo and Central. Pierucci and Slade both face two counts of third-degree felony drug possession, a second-degree felony burglary charge, and class B misdemeanors for possession of drug paraphernalia and possession of a burglary tool. Pierucci also faces a class C misdemeanor charge for providing deputies with false information concerning is identity. Both individuals made their initial appearances in fifth district court on Monday. I’m saddened by the news of any drug related crime in our community. Let’s not judge too harshly any individual involved in a drug related offense and remember what a scourge drug addiction has become everywhere. Hate the crime not the person committing the crime because no one ever wakes up wanting such an enormous problem in their life.We just don’t understand the complex brain and how it works and how some of us will become victims to a addiction by harmless experimentation over the course of many years. I wish the program ‘just say no’ really worked and there wasn’t a need for pain pills, anti-depressants, sleeping medications, psych meds for bi-polar disorder, depression, anxiety, restless leg syndrome, schizophrenia, MS and so on. Do we hate people who need these medications? No. Let’s try not to judge that’s all I am saying. I hope this arrest will get them some help. Right. Like a nice, long prison sentence. . .